His words did not resonate at all. I blew him off since I knew that my future was in distance swimming and I just really hated sprinting. When I turned to triathlon, I regretted my laissez-faire attitude about swimming fast. It is true that well swum distance events in the pool are controlled at the start. However, in triathlon, the swim start is frenzied with everyone jockeying for position. One must be able to sprint to establish a good position or at the very least to not get swum over. I revisited the sprinting concept and work hard at honing my speed in a more efficient manner. This very topic of swimming hard and swimming hard efficiently has been on my mind lately. I have had the pleasure of helping a few struggling swimmers with their stroke. When I asked them to swim hard the words of my former coach suddenly popped into my head. The reason these athletes were swimming so much slower in races than their capability is because they spin their wheels when they try to swim fast. The harder they are swimming, the less efficient they are in the water and they are expending more energy to go slower. Let me give you an analogy. Imagine you are riding your bike down a steep hill in your small chain ring in your smallest gear and you are pedaling. Your legs are moving very fast but you are producing very little wattage and you are experiencing a lot of fatigue in your legs and you are breathing hard. Suddenly, another ride coasts by in a much bigger gear, seemingly effortlessly. That is what happens to weaker swimmers and even many strong swimmers during races. They are effectively trying to swim in the wrong gear. There is so much extra energy expended on the swim that it inevitably leads to slower times in not only the swim, but also the bike and run. Here are some tips to swim faster and more efficiently when you race. Do not let your stroke become short and choppy. Try to maintain your same stroke length, but increase your stroke rate. Do not increase your body movement. In many cases, the short, choppy stroke causes extra head movement and causes the body to wriggle like a worm. Do not try to emulate the perfect stroke of Michael Phelps. I see so many swimmers aiming for a beautiful arm recovery with bent elbows. Open water swimming and pool swimming are very different. A higher recovery phase is actually very beneficial in open water swimming, especially if the water is rough. You want to be able to swing your arms over the waves. Do not drop your elbows underneath the water. Propulsion in swimming comes from what happens underneath the water. If you do not “catch” the water, you will lose momentum and speed. Karlyn Pipes-Nielsen, a top master’s swimmer and a top-notch instructor, tells swimmers to think about how you would feel if you were paddling on a paddle board (check out her video here). Adopt this high elbow technique, and then practice it until it feels comfortable whether you are going hard or easy. Do not panic at the swim start, this will only make your stroke worse. Practice going hard in your training. Do lots of hard 25’s and 50’s to get used to good technique while swimming fast. Now, of course, this is not the final word in stroke technique or open water swimming. Most people would benefit from a lesson from an expert to help them determine the shortcomings in their stroke. But, these tips should help you on race day if you practice them. Does not dropping elbows beneath the surface of the water carry through to a relaxed, non-race open water environment? Are there video examples of what you're talking about? Great article and thanks, because I'm really struggling in this exact area! You say, "do not drop your elbows underneath the water," then show a picture of someone with their elbow in the water with comments about high elbows. I'd like to see a video too. Thanks everyone for their comments. The picture above nicely shows a high elbow catch underneath the water. High elbows are referring to the fact that the elbow is above the hand and nicely bent. Many poor swimmer keep their arms straight with no bend at all, or they pull back with their elbow so the elbow and hand are on the same plane. Tim, You need to have high elbows both over AND under the water. 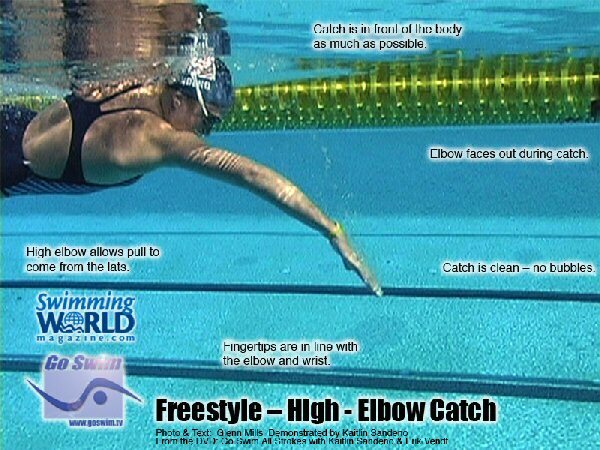 Above water, think high elbows with fingers nearly touching the surface on the recovery. Most non-pro triathlons won't have waves or chop large enough to really need any modifications to your stroke IMO. High elbows BELOW the water is shown in the photo. 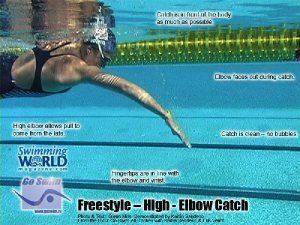 The elbows are "high" or above the wrist/hand when pulling, compared to the water surface. A "dropped elbow" is when you're elbow is parallel or even below your hand when pulling, which is very inefficient and improper technique. For videos, keep searching online – there are some good video examples on YouTube (try "high elbow catch") that demonstrate proper swimming technique, but the best option is to find a swim coach or attend a clinic to get real-time feedback. Thank you so much for explaining the high elbow catch. Also your video about the relaxed hand and strong wrist really hit home. Thank you for the great lessons! This is so helpful, and timely too! I am doing my first open water swim (practice) tomorrow, and my first sprint tri is coming up in July. As a lifelong swimmer, I'm counting on the swim leg to be my strength, but I am still nervous that I will forget everything I know, and fall apart at the start. Thank you so much for the good advice on starting fast and explaining the high elbow catch.